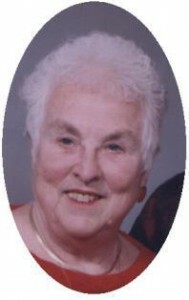 Bernice Winnemuller, age 85–Grandma to 16, Great Grandma to 2, Friend to many, but most important of all, Mom to 9! Bernice was a stay at home mom for most of her 52 married years. One of her greatest assets was her organization skills. For many years while living in “Sleepy Hollow” in Port Washington, she organized family reunions for both her family and her husband, Francis’s family. She was happiest when she could have family get-togethers and it carried on throughout her life. Just in the past few years as she tired of her skills, when her children mentioned a family function, she’d say “I’ll pay for things, and you kids put it together”. Bernice lost her battle with Ovarian Cancer on Tuesday, April 3, surrounded by her loving family. She was born on September 2, 1926 to Richard “Pops” and Margaret Pesch Bossler. Bernice grew up in Port Washington and worked at a local grocery store, many times volunteering at her father’s fish store. She met Francis in 1945 and they married in Port Washington during the historical snow storm on January 29, 1947. They went on to have 9 children. After their home was demolished by the 1964 tornado, they built their house again on the same lot in “Sleepy Hollow”, which was also known as ‘Winnemuller’s Hill’ during the winter months when they saw, on some days, as many as 100 children and adults sledding down their hill. When their children started moving out and the house seemed too large for them, they moved again and finally settled in their present home on Holden Street. Bernice and Francis enjoyed trips on their Gold Wing motorcycle, many summers going for days at a time. Bernice’s second love was playing cards. Every idle opportunity she had, she tried to get a card game together, whether it was with friends or a few of her children. Even in the past few months when her health was failing, she’d always seem to perk up when she saw more than one person coming through her front door to visit! After Bernice’s failed attempts to beat her disease, she required 24-hour care. Her 9 children, their spouses, and her grandchildren promised to keep her home and take care of her. Their 6 months of dedication, compassion, and patience was her proudest accomplishment of the children she and Francis raised! Bernice is survived by her 9 children, Paul (the late Linda) Winnemuller of Saukville, Rose (Tom) Carney of McFarland, Mary (Jim) Karrels of the Town of Belgium, Jean (Bob) Carroll of Newburg, Oregon, John (Cindy) Winnemuller of the town of Port Washington, Lois (Dave) Hartwig, Dave (Myra)Winnemuller of the town of Belgium, Lori (Glenn) Newman of Seattle, Washington, and Jim (Jessica) Winnemuller of the town of Saukville. She is furthered survived by 15 grandchildren Sean Carney, Don Marris, Mike Karrels, Ryan and McKenzie Carroll, Jackie and JJ Winnemuller, Jason, Brian, and Adam Hartwig, Rachel Moore, Sarah, and Kelly Winnemuller, and Peter and Mitchell Poull; 2 great grandchildren, Lauren Carney and Jackson Hartwig. She is also survived by her sister Hiltrude Federspiel, and sister-in-law Carol Renzel. Bernice was preceded in death by her husband, Francis, grandson, Christopher Carney, daughter-in-law, Linda, and sisters Caroline Ansay, Helen Eich, LaVerne Redig, brothers Jerald “JT” Bossler and John “Butch” Bossler. Rev. Thomas Lijewski and Rev James Ernster will celebrate Mass of Christian Burial 5 pm Thursday, April 12, 2012 at St. Mary’s Church, 430 N Johnson Street, Port Washington. Interment parish Cemetery. Visitation 1:30 – 5 pm Thursday AT CHURCH with a rosary at 1:30 pm. Memorials to St. Mary’s Church appreciated. Poole Funeral Home assisting the family.